A games room isn’t a games room without a pool table. You can hang out and watch TV but without a game to play, doesn’t it all get a bit boring? Luxury Pool Tables can be quite pricey, but they are a fantastic investment for future fun nights in with your friends. Our list of the most eye-catching Luxury Pool Tables has something to meet the needs of every billiards fan and man cave enthusiast. The Lewis is a part of the Design Range from Billards Montfort, and this particular version is manufactured in a sleek stainless steel finish. 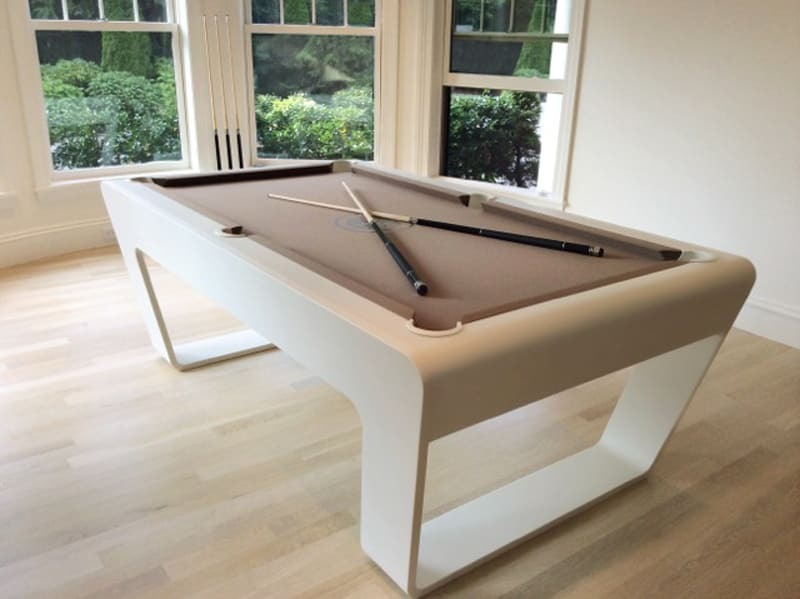 Its modern style will fit in perfectly with the many types of décor your may have in your home, this pool table could even belong in the kitchen as it can be turned into a dining table. If you’re looking for something more traditional and simple, the Glenwood may be ideal for you. This traditional table with modern sensibilities is built from solid hardwood making it very sturdy and strong. This design is a graceful addition to any home and can be customised by choosing different leg and pocket options. The Mini Cooper Pool Table is perfect for all car lovers. 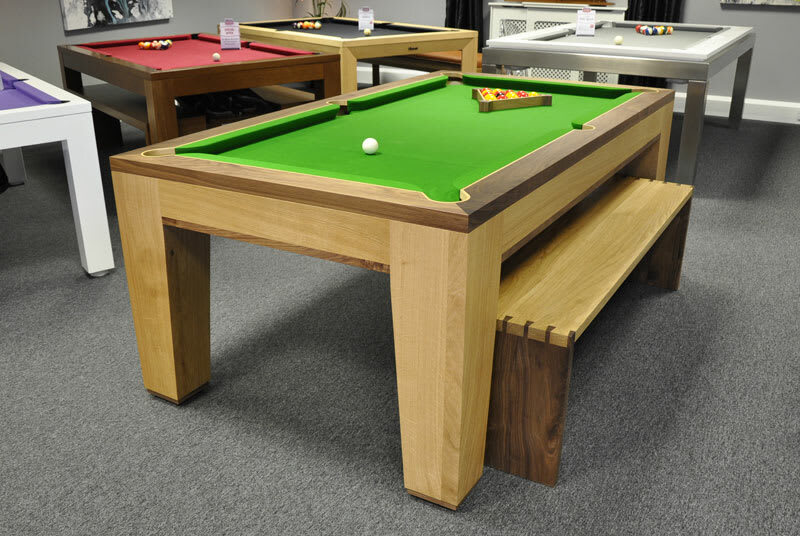 As the name suggests, this pool table is essentially a pool table fitted on top of the chassis of a Mini Cooper - which looks absolutely amazing! This professional pool table is used in many pool tournaments around the world and is Diamond Billiards’ highest grade commercial model table as it’s engineered to provide exceptional play for commercial or home use. The 247 from Porsche Design Studio in Austria has a very sleek and visionary design in contrast to some of the other bulky structures of many billiard tables. The 247 was built by Porsche Design, one of Europe’s most recognised design companies, to suit modern homes. It comes in a range of colours from Glacier White to Royal Red to suit the colour scheme of any room. The Aramith is a designer American Pool Table created by Aramtih, long-term manufacturers in the billiard industry. This pool table really is a space saver as it can be transformed into a dining table in just minutes. Toulet have created this stunning slate bed pool table for the wow-factor and it does just that. Its design is instantly recognisable and almost borders on being a work of art. It would make a great centrepiece for any games room and is great to play on too! This astonishing pool table has rocked both the motor industry and the billiards industry alike with its unique design, it’s ultimate pool table for the ultimate automobile fan, the Automaniac can even be customised to have an iPod connection and upgraded lighting! The P40 has a sleek design and great playing characteristics. The curved legs on this pool table were inspired by a river bridge in the company owner’s hometown and its shape makes it stand out among other billiards pool tables on the market! If you’re looking for a pool table that plays like a professional pool table, look no further. Sam’s Atlantic Pool Table has been approved by BAPTO (British Association of Pool Table Operators) for use in their National Tournament due to its sturdy structure and smooth gameplay which gives it that real professional feel. The Lancaster is similar to the Lewis but has a top frame made from solid oak or solid beech. Whether your room is very modern or traditional, the Lancaster billiard table will create the true ambience that you desire. Longoni Pool Tables are all hand made by craftsmen in Italy, and finished to an extremely high standard. The Las Vegas is just one of the examples of their hard work and attention to detail. This table is very sought after by interior designers due to its scratch-free finish and solid wood base which make it very long-lasting. The brand-new Le Lambert Pool Dining Table was tailored to the input of Europe’s most talented and successful pool players to ensure perfect gameplay whilst also incorporating an ultra slim, stainless steel design. The striking design of this table was inspired by a variety of ancient cultures, modernising their design aspects to make a pool diner of stunning design and quality for the modern consumer. The Spartan is a simple, streamlined design that will suit any home. The Brixton Pool Table has a contemporary look that's nicely balanced through its unique crossed shape and streamlined design.